20 OCTOBER/NOVEMBER 2017 | Pr e s by te r i a n s To d ay each time they struggle, accidentally step on toes, go to a grocery store or are stopped by police, they face the possibility, and perhaps even the likelihood, that their somebodiness will be stripped away from them just a little bit more. They don't have the privilege of being looked at and seen as an individual person. Instead, they are looked at and seen as a category or possible criminal. Not having to worry about an occasional lapse in good behavior is white privilege. Going grocery shopping with friends without being harassed is white privilege. Simply driving without being stopped is white privilege. We must stop refusing to talk about racism and privilege simply because it makes us uncomfortable. Our feelings of discomfort are less important to God than whether a black person lives or dies. God doesn't value white somebodiness over black somebodiness. And the more that good, white Christian folk refuse to address racism — in ourselves and in society — the more that black lives will continue to be taken unjustly. As Christians, we cannot in good faith say, "I don't need to worry about that because it doesn't affect me." If it affects another person who is somebody in God's eyes — and let us not forget that all people are somebody in God's eyes — then as a Christian, it affects me. If we want our lives to have ultimate significance, we are called to honor and lift up the somebodiness of all of God's people. When we do so, we live out our own somebodiness to its fullest potential, honoring our- selves, the other and especially God. Cindy Cushman is the organizing pastor of the Southern Hills Parish in Ohio Valley Presbytery. She and her husband, Kerry Rice, are the parents of six children, four of whom were adopted from foster care. Understanding our history, affirming our hope BY GAIL STRANGE AND W. MARK KOENIG R acism in the United States of America is nothing new. But to more fully understand it requires knowing our history. Racism has existed in many forms and cultures throughout history. During the U.S. colonial era legally and publicly authorized racial privileges and rights were extended to and enjoyed by white Americans. Those same rights were denied to Native Americans, African-Americans, Asian-Americans and Latino-/ Latina-Americans. The American story of race is not dissimilar to that of South Africa, birthplace of the Confession of Belhar and a place where racism was part of the legal code, institutions and common culture. 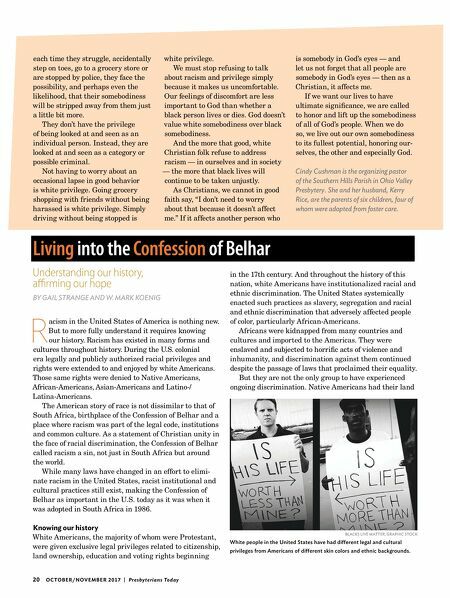 As a statement of Christian unity in the face of racial discrimination, the Confession of Belhar called racism a sin, not just in South Africa but around the world. 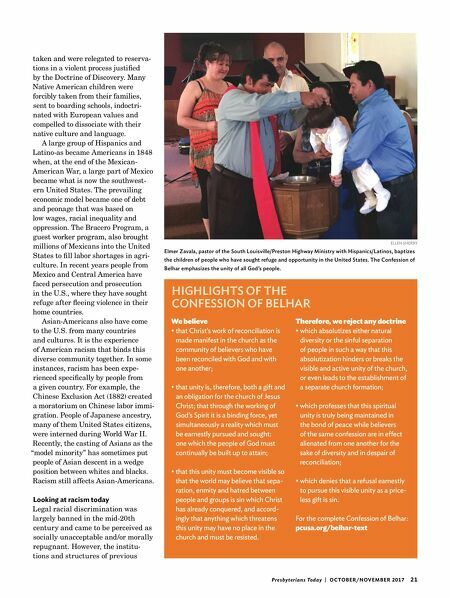 While many laws have changed in an effort to elimi- nate racism in the United States, racist institutional and cultural practices still exist, making the Confession of Belhar as important in the U.S. today as it was when it was adopted in South Africa in 1986. Knowing our history White Americans, the majority of whom were Protestant, were given exclusive legal privileges related to citizenship, land ownership, education and voting rights beginning in the 17th century. And throughout the history of this nation, white Americans have institutionalized racial and ethnic discrimination. The United States systemically enacted such practices as slavery, segregation and racial and ethnic discrimination that adversely affected people of color, particularly African-Americans. Africans were kidnapped from many countries and cultures and imported to the Americas. They were enslaved and subjected to horrific acts of violence and inhumanity, and discrimination against them continued despite the passage of laws that proclaimed their equality. But they are not the only group to have experienced ongoing discrimination. Native Americans had their land Living into the Confession of Belhar BLACKS LIVE MATTER, GRAPHIC STOCK White people in the United States have had different legal and cultural privileges from Americans of different skin colors and ethnic backgrounds.